National Collection of Korean Rubellum and hardy sprays on 3 allotments in Hertfordshire. Please contact Judy Barker to arrange a visit, September - October. 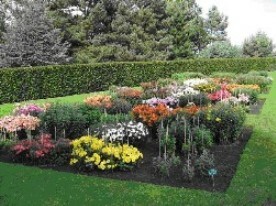 Has a designated bed of Perry chrysanthemums. Also holds the Francis Perry archive. Holders of the National Collection of Sarcococca. Capel Manor sells hardy chrysanthemums in the sales area by the shop. National Trust Wimpole Hall, Arrington, Royston, Cambridgeshire. In the walled garden there is a long border of Korean chrysanthemums. A large group of chrysanthemum plants were taken from Home Meadows nursery as they finished and cared for by Suffolk Plant Heritage. Thanks to Ivan Dickings. Reveley Lodge Bushey 58 Elstree Road Bushey Heath. An Edwardian house and garden run by Bushey Museum Property Trust. 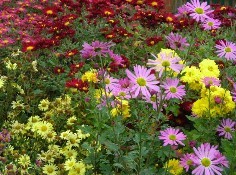 Has a good selection of old chrysanthemum varieties, from National Collection. A rare example of Victorian detached urban leisure gardens with grade 2 listed summerhouses. Teams from the Northern Group of the National Chrysanthemum Society plant out and tend the plot weekly from May until October. The best time to visit is from mid-August through Sept until October.